Installing sleeve post potholing and jet grouting. Potholing during a recent weekend closure. Metro is working to connect the Purple Line Extension to the existing Purple Line at Wilshire/Western Station. 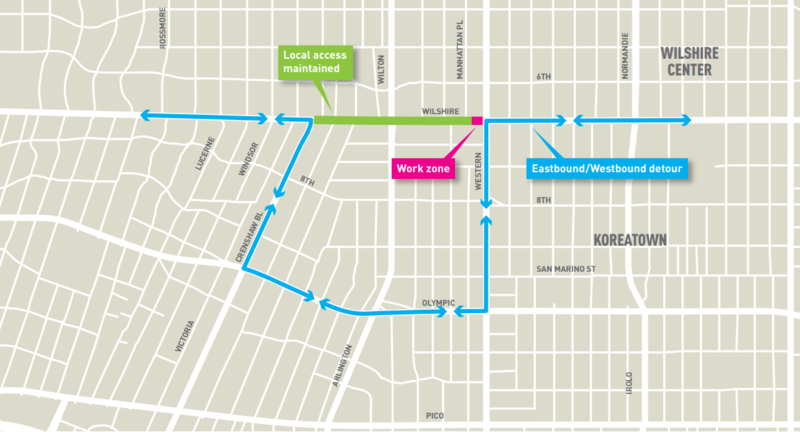 To expedite decking and to support construction activities in this very dense and heavily utilized area of Koreatown, there will be a 10-day street closure of Wilshire Boulevard between Manhattan Place and Western Avenue from Feb. 16 to 26. Fourteen full weekend closures were planned to complete the major construction activities at Wilshire/Western. However, by working around the clock for 10 consecutive days, the contractor — Skanska-Traylor-Shea — will be able to reduce the number of full weekend closures by five full weekends and reduce work at night from 21 nights to 10 nights. The full closure will be implemented on Friday, Feb. 16 at 9 p.m. and end on Monday, Feb. 26 at 6 a.m. Work within the closure will occur 24/7. • Traffic heading west on Wilshire Boulevard: take southbound Western Avenue to westbound Olympic Boulevard to northbound Crenshaw Boulevard to westbound Wilshire Boulevard. • Traffic heading east on Wilshire Boulevard: turn south on Crenshaw Boulevard to eastbound Olympic Boulevard to northbound Western Avenue to eastbound Wilshire Boulevard. During the 10-day street closure, the Metro Local 20 and Rapid 720 bus lines will not be servicing Wilshire Boulevard between Crenshaw Boulevard and Oxford Avenue. The 20/720 buses will follow the traffic detour shown above and will stop at all existing Metro bus stops along the detour route. The Metro Rapid 710 line will take Crenshaw Boulevard to Olympic Boulevard to Western Avenue and therefore will not service Crenshaw Boulevard between Olympic Boulevard and Wilshire Boulevard. The Purple Line Extension will extend the subway from its current terminus at Wilshire/Western for nine miles to Westwood. The project is being constructed in three sections. The first, which is under construction, is 3.9 miles from Wilshire/Western to Wilshire/La Cienega with new stations at Wilshire/La Brea, Wilshire/Fairfax and Wilshire/La Cienega. The first section is scheduled to open in late 2023. Sounds like this change from the original plan might save a good deal of time. Are they aiming to finish ahead of schedule, or is it too early to tell? Yeah, why weren’t 3rd & 6th Sts recommended?? By telling everyone to divert to Olympic and also only use Olympic as a Detour route for buses doesn’t help transit at all. It’s said “will stop at all metro existing stop along the detour route”. The the fact is none of them willing to stop. My son 6 grade have to walk from Western/Wilshire all the way to Olympic/Wilton . That is the detour route, they don’t want to stop. So I don’t mine with the detour but have a heart for these kids will ya !!!!!!!! !